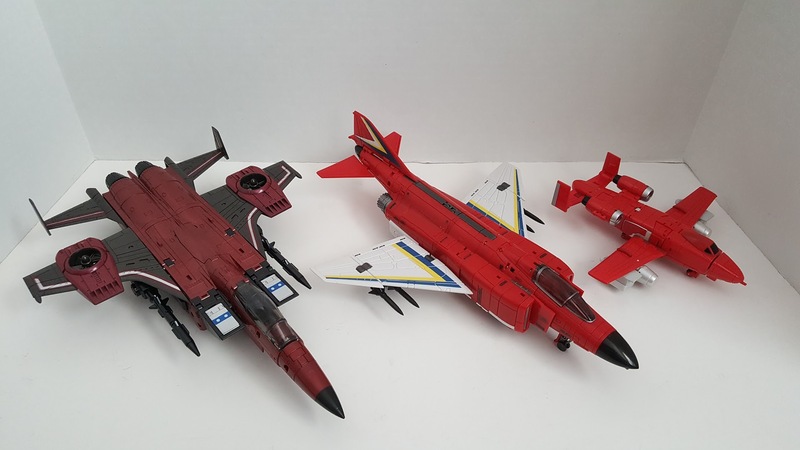 I got a bunch of third party Masterpiece-styled red jets lying here and there, so I thought I compile them and make a post. Here they are. This 3P homage to Thrust by ToyWorld is an incredible figure. I kinda went into their awesomeness back in this post, see that for all the details. Lots of TransFans give these TW Coneheads a hard time, and I say they’re totally trippin’. Don’t believe them. Subscribe to my TF authority and go get these while you can. Newcomer Zeta Toys is responsible for this 3P MP homage to Aerialbot Fireflight. Fireflight is probably my least favorite Aerialbot. His alt mode as a F-4 Phantom is one of the worst of the jets. And he has no personality whatsoever. Honestly, I can’t really say anything else about him. Other than he was mysteriously missing when all the other Aerialbots were fighting that giant purple robot griffin in “Aerial Assault“, one of my favorite eps from G1. Zeta Toys is supposedly a split-off from ToyWorld. Well, split-off may be too professional a term here. What I heard is that the design engineers at ToyWorld didn’t feel they were getting what they deserved and had a falling out with management. So they took their designs, left ToyWorld, and formed their own company. The result is Zeta Toys. This is evidenced by how some products overlap between ToyWorld and Zeta. Anyway, back to Flyfire. I like the figure. He looks good in both alt mode and robot mode. The engineering is top-notch, and I wouldn’t have expected any less from the designers behind some of ToyWorld’s best offerings. The transformation is satisfying, striking a good balance between complexity and fun. Flyfire is Zeta’s second Aerialbot, the first being Airstrike (Air Raid). I liked Airstrike as well, but there were some minor construction hiccups here and there. Zeta has obviously learned their lesson from that first offering, and as the sophomore figure Flyfire is much more polished. At only $65.99, Zeta is making these extremely affordable. However, that does come at a price. The materials used for both Flyfire and Airstrike feels incredibly cheap for something that is supposed to be MP quality. That’s pretty much my only complaint about these figures. Next to TW Assault, the cheap plastic become more than obvious. I wonder if TW planned to make these with superior materials, but now we’ll never know. But as it is, Flyfire is still a recommended figure. These are currently the best MP styled Aerialbots you can buy on the market. ZT is getting quite clever with the naming. Hasbro can no longer use the term Fireflight, so modern productions of this character go with Firefly. ZT just reversed it and call it Flyfire. What will these crazy Chinese engineers think of next. 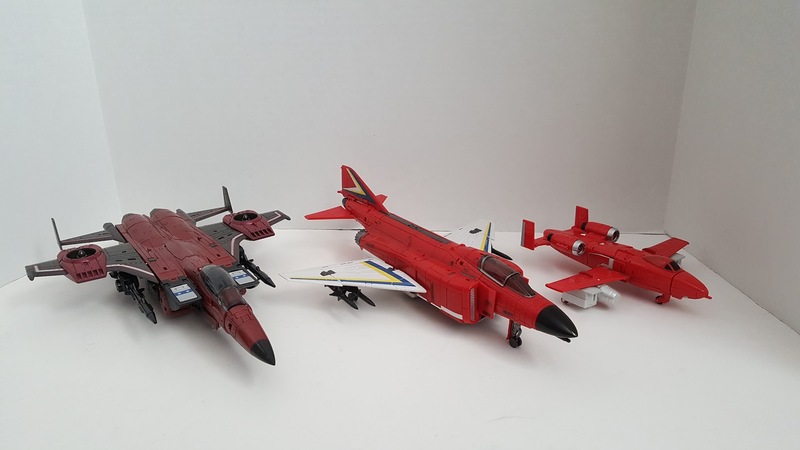 The last of these 3P MP red jets is DX9 Richthofen. I had to Google what is Richthofen. Apparently that was the last name of the Red Baron. Anyway, this figure is obviously Powerglide. And what a figure this is. I have been really enjoying all my purchases from DX9, such as Invisible, Carry, and Gewalt. I hold DX9 in the highest regard possible, and they did not let me down with Richthofen. This is an amazing figure. Both alt mode and robot mode looks good. DX9 really studied the G1 animation models and produced a figure faithful to the show’s appearance. Unlike Flyfire, nice quality materials are used for the figure. Construction of Richthofen is superb. In fact, it may be too good, as all the joints are super tight. My hands hurt when trying to transform this guy. This may be due to the fact that some productions runs of Richthofen had a manufacturing problem, where there was a loose tail fin. DX9 corrected this in later runs, but the result is all the joints became way too tight. I got one such figure. Still, I rather have joints that are too tight than too loose. Other than the tight joints, Richthofen is a blast to transform. It’s just the right amount of complexity and challenge. I’m hoping the joints will soften after a few transformations. He even comes with a Astoria figure, from “The Girl Who Loved Powerglide“. And when you open his chest panel, there is a heart shaped mold engraved there. Gotta give DX9 points for show accuracy, as cheesy as this feature is. Richthofen has a place in your collection.